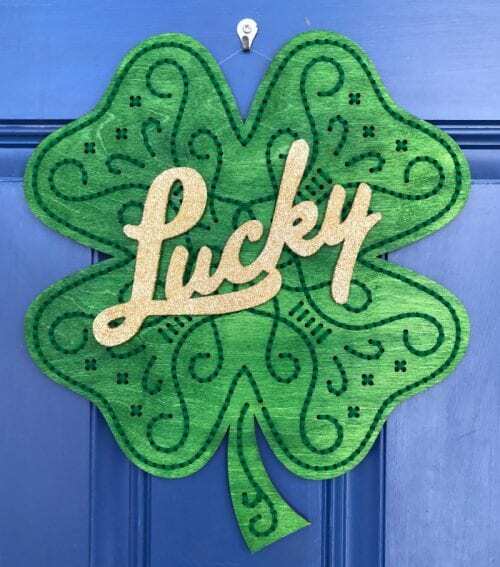 Learn how to make the Stitch of Luck Craft Kit by Apostrophe S. An easy DIY craft tutorial idea for St. Patrick’s Day Decor. Do you decorate for St. Patrick’s Day? I must be honest, I usually don’t, but when I saw this stitched green shamrock I couldn’t resist! 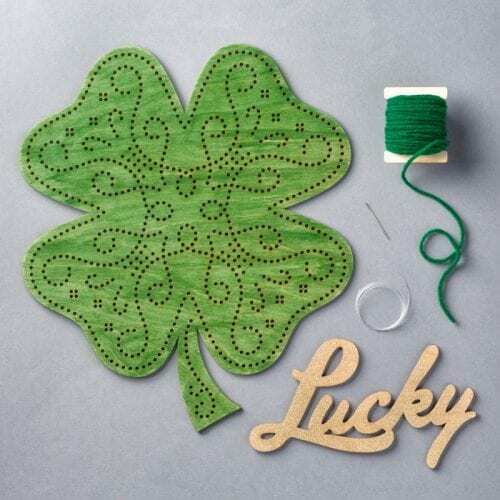 This fun decor item is actually an Apostrophe S Craft Kit called Stitch of Luck. The cost of the kit is $22 and comes with most everything you need so this lucky piece of art is ready to hang and display in no time! Sorry, this kit is no longer available. 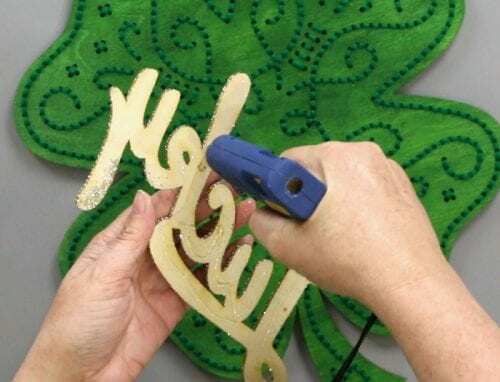 The laser-cut wood shamrock comes already hand painted in green so you can get stitching right away! Looking closely at the wood piece you will see a faint line between the dots. This is the stitch line to follow. There are actually two different stitches you can do on the shamrock. A traditional stitch or a backstitch. The traditional stitch leaves a space between each stitch, while the backstitch has no spaces. Here is a comparison of how the Stitch of Luck looks completed with the two different stitches. Before we can begin stitching, we must cut a length of yarn and thread the needle. Getting yarn through the eye of the needle can be a headache, so an easy way to do it is to fold a piece of tape over the end, trimming close to the yarn and cutting the tip at an angle. All fibers of the yarn will go through the eye and it is super quick and easy. Watch the video above if you need a visual of what to do. Tie a knot at the end of the length of yarn and begin stitching by pushing the needle up and down through the laser-cut holes. When you are close to running out of yarn, tie a knot on the back of the shamrock and start with a new piece of yarn. Stitching may take a couple of hours, but it is totally worth it! Doesn’t it look pretty! Oh, and can you find my one missed stitch? Oops! Next, add the glittered gold Lucky to the front of the shamrock with some hot glue. You can place the Lucky wherever you like, the top, bottom corner, or to the side. I went with smack dab in the center. The kit also comes with some fishing line to hang to the shamrock. I tied it on by going through the stitched x’s in each upper corner. You can’t even tell it’s there! Now it is ready to hang! Hang it on the front door to greet your friends and neighbors or hang it inside. 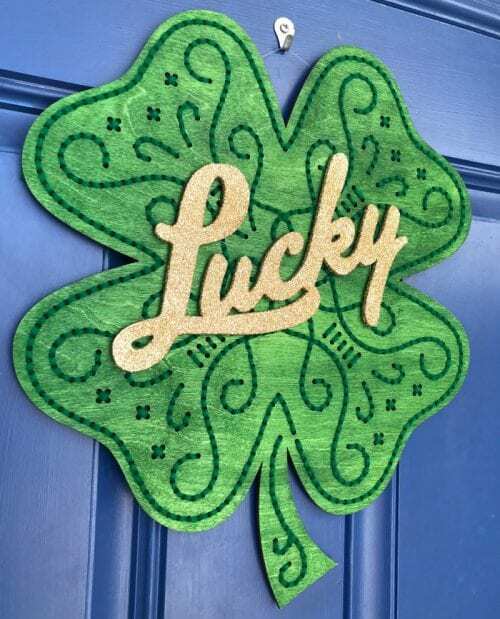 Where would you hang this Lucky Shamrock? Share and leave a comment below! 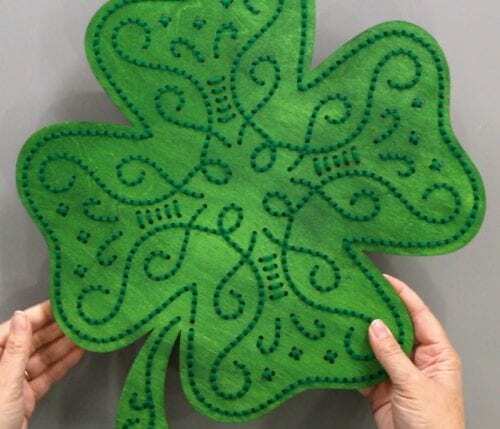 SAVE HOW TO MAKE STITCH OF LUCK ST. PATRICK’S DAY DECOR TO YOUR FAVORITE HOLIDAY PINTEREST BOARD! This turned out really cute! Thanks for sharing with us this week at Brag About IT! Pinning to share. Thanks, Laurie! I love how it turned out! What a cute kit. I’ll have to check out that website I’ve never heard of them but I love this shamrock. Thank you so much Jennifer, it is really a fun kit to put together and looks super cute hanging on a wall or door.